The Valley Oak Genome Project conducts research across the range of Valley Oak in California. We acknowledge the Chumash, Tongva, and other Native peoples of California as the traditional caretakers of the land where we study and for their past and ongoing sustenance of oaks and oak ecosystems of California. We acknowledge all Native peoples of western North America for their sustenance of the land, habitats, and species of this region. 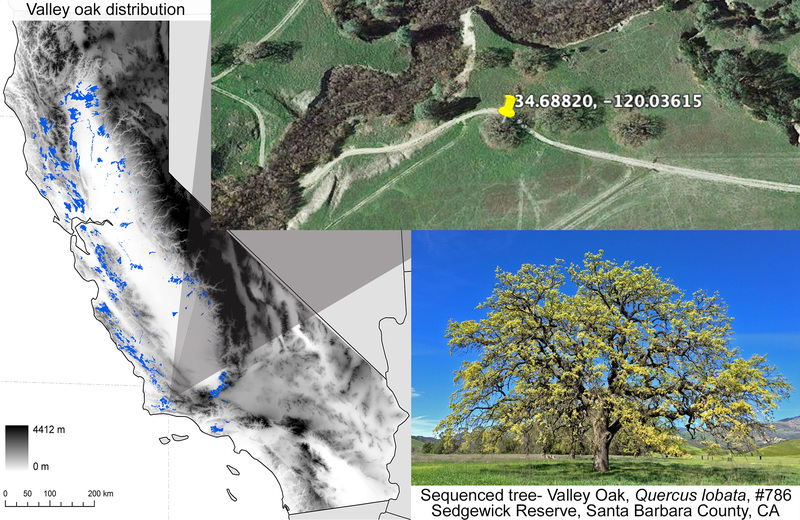 The Valley Oak Genome Project is an over-arching research program centered on an NSF-funded partnership between UCLA and Johns Hopkins University to produce a high quality annotated assembly of tree #786 of Quercus lobata, a widespread California endemic oak species (NSF grant #1444611). Related to this project are several collaborative studies including: first draft genome sequence, reference transcriptome, epigenetic studies, and a provenance study. On this site, the public will be able to access the databases used in these studies and descriptions of the related projects. We hope that this research provides valuable genomic resources to the oak research community and valuable information useful to the management of tree populations. Valley oak, Quercus lobata, is considered a keystone species that shapes the ecosystem and its biodiversity where it is found. Valley oaks are important to California’s diverse Native American communities and their cultures, including influencing historic trade routes, and location of settlements. The sustainability of California oak ecosystems relies on how oaks will tolerate a changing climate, which is the central motivation for this project. We acknowledge and thank the Native peoples of California for their stewardship of our ecosystems.